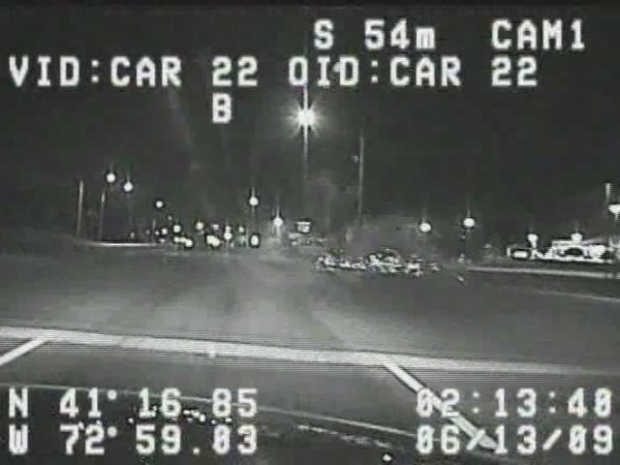 Dash cam video shows the crash that killed two Orange teens in June. A former Milford police officer will go to trial to face charges filed in connection with a cruiser crash that killed two teenagers last year. Jason Anderson has pleaded not guilty to manslaughter charges and refused a plea deal on Tuesday. Police said Anderson was driving 94 miles an hour while returning from a mutual aid call in West Haven and didn't have his emergency lights or siren on when the teens' car turned in front of him on Route 1 in Orange on June 13. Two 19-year-olds from Orange, David Servin and Ashlie Krakowski, died in the crash, which was caught on video by a camera in another officer's cruiser. Milford officials fired Anderson in December.